Dressed as snowflakes, the girls joined over 500 Spirit of America dancers from around the country in a performance of a lifetime in front of the flagship Macy's department store in New York City. 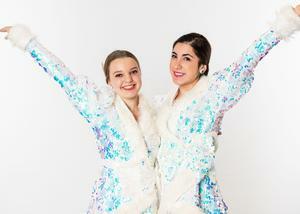 Smithson Valley High School freshmen, Jelly Bequette and Ryann McAnelly, both members of the Junior Varsity Silverados dance team, braved record breaking cold weather to perform in the 92nd Macy's Thanksgiving Day parade. Dressed as snowflakes, the girls joined over 500 Spirit of America dancers from around the country in a performance of a lifetime in front of the flagship Macy's department store in New York City. The girls even got to usher in Santa Claus and debut a new balloon that joined the parade route this year. "I've grown up watching the parade with my family every year, so to actually be apart of it this year was extra special. ", said Ryann McAnelly. The parade was the coldest in history with temperatures dipping below 20 degrees. After five days of rehearsals and early wake up calls, watching the crowds cheer along the parade route made the cold weather bareable. "It was a trip of a lifetime", said Jelly Bequette. The girls earned the honor of dancing at the 92nd Macy's Thanksgiving Day parade when they auditioned at the Showmakers of America dance team summer camp in June. The girls worked on saving up funds to attend the trip and were honored to be apart of this iconic parade and represent Smithson Valley High School and their team.